Today is officially the first day of summer … yippee!!! I have said before and I’m sure that I’ll say it again … where does the time go? There are not enough hours in the day. My To Do list is way too long … everyday stuff, crafty things that I want to do, gardening that needs to be done, not to mention blogging and how far I’m behind visiting other blogs … always playing catch-up! * You will have leftover candy coating, but need the larger amount for easy dipping. 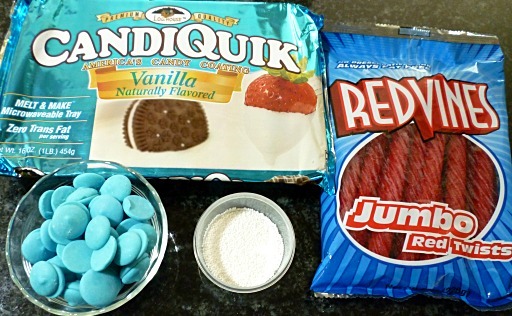 For step by step directions refer to the Licorice Flag. I confess, today I say yippee for summer … when it’s over 100° … I’ll be wishing for fall to arrive! I ♥ your comments ! Thank you so much Colleen 🙂 I wish you the same! Brenda, your brain is not lame … unless mine is too 😉 My first thought was pretzels … I just made it simpler by using licorice and eliminating the red candy coating! I am so making this!!! Thank You for the great ideas..things like this makes the day just a little moe special!! Thank you Christine 😉 It makes me happy that you like them! Ugh that’s supposed to say waaay cute! that’s what I get for dropping it! I love this more than you ever know!! SO great! Lulu, The first thing that comes to my mind involving the barbeque are S’mores. Have you seen my S’more Cones ? We have several cookbooks from Weber BBQ that have recipes for desserts … I have not tried them yet. DO ANY OTHER READERS HAVE SUGGESTIONS? 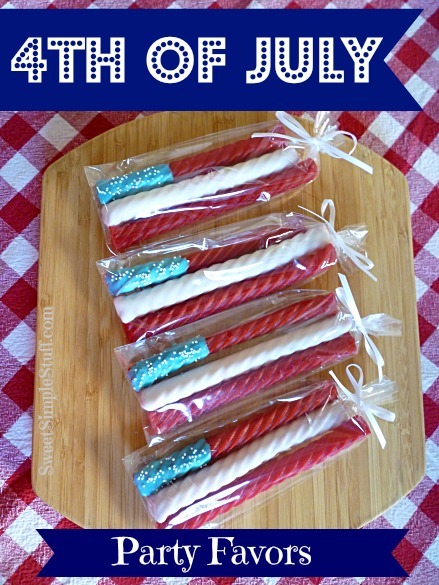 Brenda, besides this being a clever use of licorice for a 4th of July celebration, I like that the little flags can be bagged and ribboned, thus keeping tiny hands from handling all and grabbing too many! Thank you Kathleen 😉 The same goes for big hands!!! 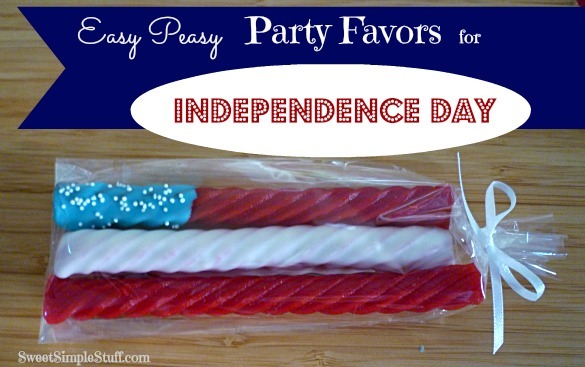 At what length did you cut the licorice for the party favors? What brand/size are the bags? Pinning…thanks for this different idea. Hi Maria, I didn’t cut the licorice. I used Red Vines, but twizzlers would work too!